Today I made a scraplayout with the use of some kitchen utilities. I used them as stamps! 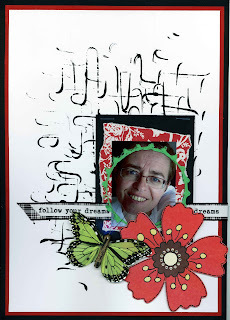 It's a challenge from Birgit's blog. I used the large metal thing you see on the photo for the background. In the Netherlands we use this to mash the potatoes and vegetables for what we call: stamppot (hotchpotch?). 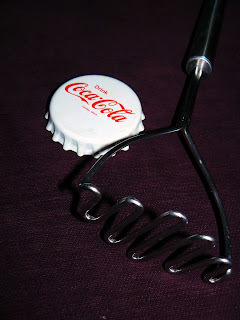 The CocaCola item is a bottle opener. I stamped it on a transparant sheet with green acrylic paint. It was fun to do! You should try it too! It looks cool, Anniek. Love that idea.